East Coast is one of the best live wedding bands in the New York area. They perform all types of events but a wedding is by far our specialty. East Coast has performed thousands of wedding events all over New York and Long Island. Wedding receptions are brought to life with the energy of a live band that your guests can enjoy dancing and watching. East Coast knows how to create moments to remember and deliver a fantastic show every time they perform. If you are looking to hire a live band for your New York wedding, East Coast is definitely the way to go. They play everything from current hits to jazz standards to funk and everything in between. They play every type of music with style and class. There is nothing quite like seeing music live…that’s why concerts are so popular! East Coast plays every song with stylistic accuracy. If you are looking for a live wedding band to provide energy and entertainment to your celebration, East Coast is the band for you! 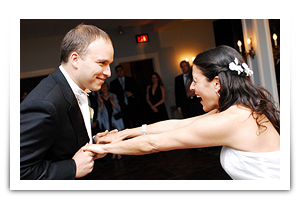 When booking your New York wedding, it is possible that you are debating whether to hire a live band, a DJ, or both. If you want your event to be unique and full of fun loving memories, live music somewhere in your event is the way to go! We offer a band/DJ combo for those who need music played by the original artist.